Water heaters are a little bit like cars; when you pay 22k for a sedan, there’s not very much to distinguish one brand from another. However, compare a basic economy model to a top-of-the-line BMW and you’re certain to notice some differences in build quality and performance. What is this then? A Mercedes? A Lexus? 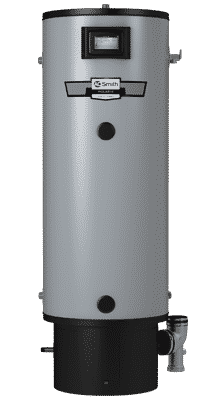 Introducing the Polaris high efficiency condensing gas water heater from AO Smith, an extremely efficient new design that offers a little bit of everything. With its submerged combustion chamber and spiral flue design providing up to 96% thermal efficiency, it can do double-duty as a heater for hydronic heating applications in addition to hot water service. When we say 96% thermal efficiency, take note – this is efficiency equaling a tankless system. Even the smallest Polaris model can deliver 129 gallons per hour at a 90° temperature rise; practically two gallons a minute, forever. The 50 gallon model can do 253 gallons per hour! The great advantage of tankless systems has always been energy efficiency, but the smaller units you most often see are engineered for one tap at a time. Meanwhile, if you have a crowded house where people and appliances often use hot water simultaneously, tanked systems have the on-hand capacity to serve multiple users. Polaris heaters offer the energy efficiency of a tankless system, plus all the capacity advantages of a tank to meet the demands of an entire family. The best performing material for water heaters would be copper, hands down, with its outstanding heat transfer performance, resistance to corrosion, and antimicrobial properties. Problem is, it’s also prohibitively expensive, such that you won’t find copper heaters on the market at all. Instead we see less costly steel tanks, and even with glass or enamel linings and galvanic corrosion protection, you can only extend their life so far. Eventually, thermal stress and corrosion come calling. The Polaris heater’s high grade 444 stainless steel alloy with brass connections offers durability and performance comparable to copper at a more affordable price point. The control system of the Polaris monitors demand and adjusts heating accordingly, so energy consumption is tailored to usage. It’ll kick the BTUs way up when you’re filling the tub, then ramp the gas down when idle. This modulating gas control system tunes the heater for maximum efficiency regardless of how taxing the demand may be. Adding to its efficiency is a multi-pass helical heat exchanger that recovers heat from the flue gas on its way out the exhaust. The heater also has a “combi” option through side outlets for hydronic heating. Yes, these heaters do cost more than their run-of-the-mill counterparts. If your conventional tank cost you $1200, a comparable Polaris will run you closer to $6000. But conventional heaters on hard water service are very likely to fail in six to eight years, while the Polaris will easily go fifteen to twenty. Install it with a water softener, and it’s probably the last heater you’ll ever buy! Payback is not just higher energy efficiency, but much lower likelihood you’ll ever be paying an insurance deductible due to a tank failure. We’re excited about the Polaris heater; its outstanding efficiency, durability, and flexibility makes it worth every nickel – the Ferrari of hot water tanks. We’d love a chance to talk to you about it, so call us for a free consultation.